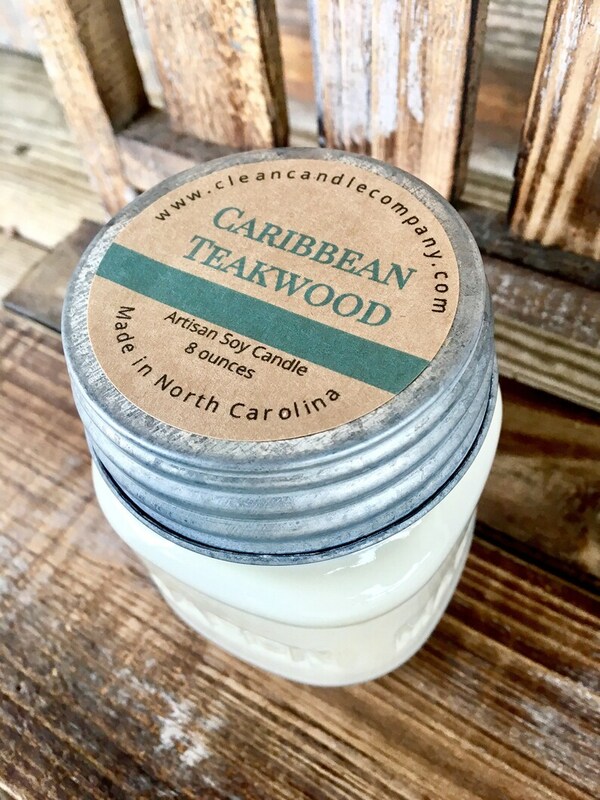 Caribbean Teakwood- our most popular scent in our men's line! It is bold and complex - leading with a top note of leather, tobacco, amber and musk. The middle is a spicy mixture of black tea and pepper. The base note is aged teakwood with tones of patchouli and sandalwood. Wax Melt- 2.5 ounces * Enjoy for 10+ hours! 8 oz - Enjoy for 50+ hours! 16 oz- Enjoy for 100+ hours! Our candles are all hand-poured by small batch, using only the finest ingredients. We use the maximum amount of scent that the soy wax will hold to give you a strong scented high quality candle. Awesome! One of the best Etsy sellers I worked with:) and amazing products! It's a great idea but doesn't quite smell like a camp fire to me. These smell so wonderful! Arrived timely super excited! Love the sticker! We LOVE making custom orders! There is no extra charge for us to create the perfect label for your ocassion. If you envision any certain type of font, or have a preference towards white or brown kraft labels (keep in mind, color will not show up quite as well on the craft paper labels), please let us know. If you are purchasing a product that needs to be personalized with monogram initals, names, birthdays, etc, all info and details should be written in the 'note to seller' box when checking out. Please spell check and write it exactly how you would like us to print it! Please note: We reserve the right to cancel an order and issue a full refund if the request contains profanity or explicit content. Yes, we offer wholesale! Please message us for details. We would love to have you join our wholesale family! Soy wax has a memory and should be allowed to achieve a full melt pool on it's very first burn (when you have plenty of time!). If it is extinguished prior to allowing a full melt pool, all subsequent melt pools will not go past the first one and will tunnel into the center of your candle. To create a full melt pool, burn the candle for a minimum of one hour for every inch of it's diameter. All future burns, no matter how long it is lit, should follow the first one's path and melt fully to the sides of your container. This also allows for a strong and long lasting scent throughout the life of your candle. Trim your wick 1/4 inch before each lighting! If not trimmed, it can cause glass to break, even though we do use heat-safe glass.